We had a terrific evening out last Friday at the Lawrenny Arms inn where we did one of our “out on the road” concerts. The venue was a marquee fully equipped with barbecue and bar so a good time was had by all. The concert followed on from a very successful appearance at Pembroke Castle the week before and for both concerts the crowd particularly enjoyed singing along with Eric Mullins and the choir for the hippopotamus song. Young and old enthusiastically joined in to sing Follow me Follow down to the hollow etc. As the tide was out at Lawrenny there was plenty of glorious mud in view but a lovely venue all the same. The crowd also enjoyed Climb Every Mountain so much that there was a request to sing it again at the end of the concert and a novel deviation from the normal stage singing happened as the choir walked amongst the audience singing it as the audience joined in with what they could remember. That’s something we haven’t done before and it seemed to go down very well with the audience. A further encore was demanded so the choir rounded off the evening with the rousing Welsh song Men of Harlech. With the words “he is bravest he who leads us” being very appropriate for a Musical Director showing the courage and determination to turn up “just a little” late following car problems. But the choir had nonetheless soldiered on alone for a couple of songs to the appreciation of an audience containing more than a few Saxons before our musical director came to the fore. The ever smooth Dave Blackmore in his customary role of Master of Ceremonies kept the crowd informed and amused throughout this minor hiccup. 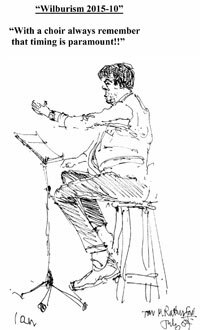 Our next concert is on Thursday 23rd July at St. Mary’s church and tickets can be purchased on the door or via our website. 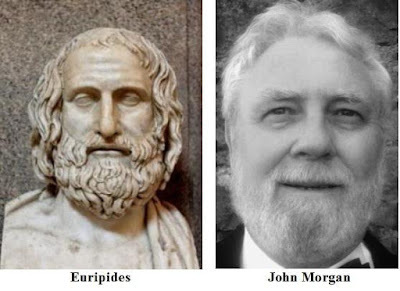 This is a quotation from the writer of Greek tragedies Euripides who some say bears a striking resemblance to chorister John Morgan but John is certainly no Deacon Blue. He is in fact a very happy deacon having recently been ordained as a deacon of St. Mary’s church. Congratulations to John. Our accompanist Jill Williams is usually the lone female performer at concerts and rehearsals as we are after all a male Voice choir but we are all very appreciative of Jill’s terrific accompaniment and we were very pleased to celebrate her birthday just the other week and to enjoy a slice of birthday cake. 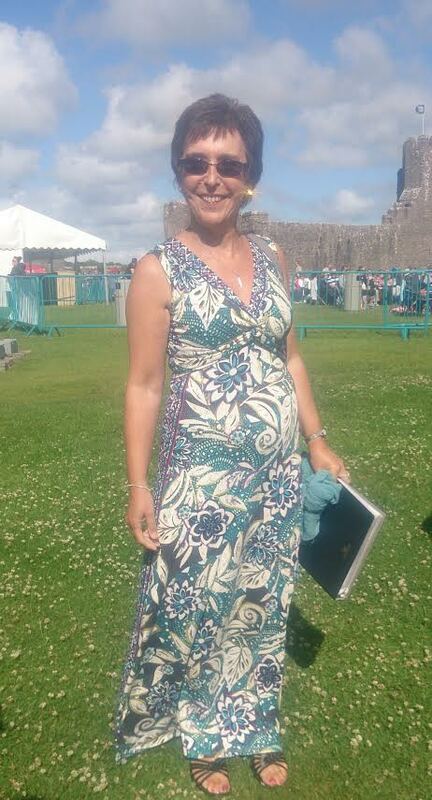 This picture is of Jill about to go on stage at the Pembroke Castle concert last week. New members and supporters are always welcome and anyone can come along to a rehearsal and learn about what choir membership is all about. Rehearsals are on most Tuesdays and Thursdays unless we have a concert on one of those nights. So come along, have a listen and discuss what it’s all about with other members with a post-rehearsal pint to learn how you can support the choir or talk to us if you have a view or some doubts. We are always interested in people’s thoughts about the choir especially those of younger people.